Morray Engineering - the perfect choice for all your packing needs including bagging machines, robot palletizing, weighing, sealing and stitching. Located in Braintree in the south east of England, Morray Engineering's Production facility is located just off the A12 with easy access and good parking facilities. Before visiting please Contact Us first, this will ensure that the best resources will be available to make the most out of your visit. We offer prompt and comprehensive aftercare with every piece of equipment we manufacture. From bagging machines to heat sealers, from robot palletizers to sack placers and from stitchers to conveyors. The Company was formed in 1965 with the intention of acting as a design and development consultancy for the bottling and air conditioning markets. As a result of a quirk of fate shortly after starting the company, the founder through a farming friend came upon a revolutionary device for bagging vegetables that had been designed by the farmer's mechanic. At the time nothing similar existed so it was considered that, with some development and marketing, the machine could have significant sales potential both in the agricultural and industrial markets. By 1967 the machine was selling well and a fundamental decision to concentrate the company's resources on developing bagging and weighing units was taken. As new bagging and weighing products were designed it became obvious that related ancillary equipment would be required. So in 1970 Morray began its long association with Newlong of Japan who manufactured bag-closing equipment. By 1975 Morray were the leaders in the UK Agricultural Market marketing automatic bagging and weighing machines and closing lines for products ranging from fertilizer to vegetables. At that time exports to overseas markets began with the USA for a considerable time accounting for almost half Morray's production. Morray's growth came to an abrupt halt in 1978 when a disastrous fire wiped out the production facility and it was only after sterling efforts by all the staff and more than adequate insurance cover that the company survived and returned to full production. In 1980 the existing facilities were becoming inadequate for the market demand so the decision was made to purchase the Anglia Way premises which became the Head Office. 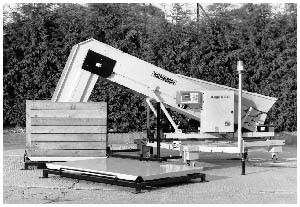 Throughout the early 1980's the Company continued to concentrate on the bagging and weighing equipment market both at home and overseas. As the decade drew to a close it seemed that this market alone could not offer growth prospects so the decision was made to develop a range of complementary products for Industrial customers. 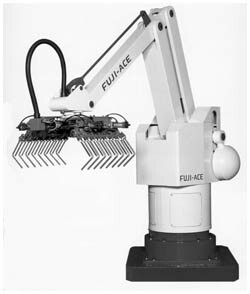 Fundamental changes in design philosophy and construction techniques were required to produce equipment successfully for these new applications but after some false starts these new products became an important revenue earner for the company. In 1992 it was clear that more and more customers were looking to single suppliers for all their material handling requirements so extra effort was put into further developing the companies product range. Customers had been demanding palletising equipment and, initially, it was thought that we could design our own but after an interesting meeting with Newlong who were agents for a revolutionary robot palletiser it was decided to investigate it's potential in the UK market. After 2 years testing and market development in 1994 Morray sold its first robot system in the UK and it is a testament to the care with which this research as done that it is still the agent for the same machine with 250 installations in place in the UK today. As turnkey business became more a major part of Morray's turnover additional products were introduced into the range with highlights being Morray's own fully automatic sack placer in 1996 and the Binder range of sack placers and form, fill and seal machines being added in 1997. With the increasing sales of palletising systems pressure on production floor space became acute and in 1998 a purpose built 8000-ft³ production facility was completed which allowed full assembly and test of complete robot systems before despatch. In the last four years Morray has concentrated on developing a professional approach to systems integration by applying it's 50 years of experience in bespoke solutions, investing in the latest computer technology and, more importantly, talented people to ensure that Morray products are delivered on time, within budget with outstanding performance and long term backup and support. This approach has been rewarded with numerous repeat orders from blue chip customers both at home and overseas. After some difficult times in the early 2000s Morray has now returned to its spiritual home in Braintree after the assests and intellectual property were purchased by the Sack Filling and Robot Palletising Company..